What is a parasiticide or an antiparasitic? Veterinary parasiticides or antiparasitics are products that kill parasites that infest livestock, pets and other animals. All parasiticidal finished products consist in one or more active ingredients that have the specific efficacy against parasites, together with a series of non-active or inert ingredients that are usually called "formulation". Typical non-active inert ingredients are solvents (e.g. water, alcohols), stabilizers, preservatives, emulgants, etc. The term parasiticide or antiparasitic is used both for finished products and for the active ingredients they contain, that are actually effective against the parasites. Ectoparasiticides: control external parasites (= ectoparasites) such as flies, ticks, mites, livce, fleas, etc. Endoparasiticides: control internal parasites (endoparasites) such as roundworms, tapeworms and flukes. Most endoparasiticides are anthelmintics, i.e. effective against helminth parasites = parasitic worms. Endectocides: control both external and internal parasites. For regulatory purposes, in many contries most endoparasiticides are considered as veterinary medicines, whereas most ectoparasiticides are considered as pesticides. One reason is that the vast majority of ectoparasiticides contain active ingredients also used as agricultural pesticides. Most parasiticidal active ingredients have similar chemical structures and share many features. They are often grouped into chemical classes or families. Among the veterinary parasiticides there are several chemical classes such as organophosphates, synthetic pyrethroids, benzimidazoles, etc. All parasiticides have a number of general characteristics that determine their suitability for the control of parasites on livestock and pets. The spectrum of activity refers to the number of parasite species a product or an active ingredient can control. Some products have a broad spectrum of activity and this means that they control many different species, e.g. flies, ticks, mites, fleas, etc. Other products have a narrow spectrum of activity i.e. they only control a few species (e.g. only fly maggots, or only flukes, or only lice, etc.). This term usually refers to the cellular or molecular mechanism(s) by which an active ingredient kills the parasites. Most active ingredients of the same chemical class (e.g. organophosphates, benzimidazoles, etc.) have the same mode of action against parasites. Different chemical classes usually have different mode of actions, although there are chemical classes with very similar modes of action, e.g. organophosphates and carbamates; or organochlorines, synthetic pyrethroids and phenylpyrazoles. The mechanism of action is very relevant from various points of view. One point of view is safety. Some parasiticides act on cellular or molecular mechanisms that do not only occur on the parasites (insects, worms), but also on other animals, maybe also in mammals (e.g. humans!). Such compounds can be toxic not only for parasites, but also for livestock and pets and must be handled very carefully. Othe parasites act on molecular mechanisms specific for insects or worms, e.g. 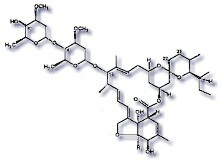 benzoilureas, benzimidazoles, etc. Usually they are safer for livestock and pets. A product with a broad spectrum of activity may also represent a serious threat for the environment: accidental contamination of a river may kill many insects, fish, and other animals living in the water. Another point of view is resistance of parasites to parasiticides. In fact, parasite populations can become resistant to parasiticides, and this usually happens when parasites find a way to get around or overcome the mode of action of the parasiticide. Such parasites will become resistant to all parasiticides with the same mode of action, whether or not from the same chemical class (so called cross-resistance). Another point of view is profitability: the broader the spectrum of activity, the more pests can be controlled, the more convenient for many farmers or pet owners, the more profitable for the manufacturers, etc. Discovering parasiticides with a new mode of action is the dream of every laboratory working on parasite control. The reason is that it is becoming more and more difficult to find them: after the introduction of ivermectin in the 1980's it took about 25 years to found a livestock anthelmintic with a new mode of action (monepantel). Curative efficacy is the effect that a parasiticide shows against an already established infestation, i.e. how many parasites it kills. Usually it is expressed in percentage control. If a parasiticide offers 95% control of a parasite, this means that on average, 95% of the target parasites will be killed when the product is used according to the label reccomendations. This also means that 5% of the parasites will survive! In real figures, if a animal is infested by 100 individual parasites, 5 will survive. If it is infested by 10'000 individual parasites, 500 will survive! Is it possible for an animal to be infested by 10'000 parasites? YES! E.g. with ticks, lice, mites, etc. It is good to know, that for a parasiticide to be approved against a particular parasite, most regulatory authorities require the experimental proof that it controls at least 80%, better 90% of the parasites. In some particular cases proof of a 100% control is required (e.g. certain sheep mites and lice in certain countries). It is usual that a specific parasiticide administered at a given dose in a specific delivery form shows different levels of efficacy against different parasites. E.g. an ivermectin injection for cattle at the classic dose of 200 mcg/kg will control roundworms, mites and some lice species, but no cattle ticks and horn flies. An ivermectin pour-on for cattle at the classic dose of 500 mcg/kg will control roundworms, mites and some lice species and will provide some control of cattle ticks and horn flies too. Within the curative effect, "speed of kill" or "knock-down effect" is sometimes an important feature of a parasiticide. E.g. there are some flea control products that kill 95% of the fleas within 1 or 2 hours after administration to a dog, whereas other products need 1 to 2 days to achieve the same level of 95% control. 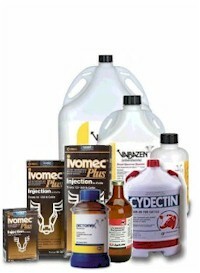 Insect development inhibitors such as those used against lice and blowfly strike on sheep, against cattle ticks, or against pet fleas are typical active ingredients that "kill softly", i.e. slowly: they need weeks for reducing the parasite population in an infested animal. Many parasiticides do not only kill the parasites within minutes or hours after administration, but provide some degree of protection against re-infestation too, e.g. because they remain in the wool of sheep for months and will kill whatever parasites try to re-infest it. The length of protection is a key product feature for many parasiticides because most users prefer a long lasting protection, even if they have to pay more for it. The length of protection of a product depends on various factors: e.g. solubility in water (to resist rain and washing), volatility (a few products evaporate very quickly), sunlight resistance (many compounds break down when exposed to sunlight), metabolism in the hosts' organism (some products are quickly metabolized or excreted, other products remain stored and are slowly released, etc.). The safety margin also called safety index is the ratio between the single dose of a medicine that causes no clinical adverse reactions in the target host, divided by the single therapeutic dose recommended. If the tharapeutic dose recommended is 10 mg/kg body weight, and the highest dose that causes no clinical adverse reactions is 50 mg/kg body weight, the safety margin would be 5. For practical purposes a safety margin of 5 means that administering twice the therapeutic dose (on purpose or due to an error) should not bear serious risks of adverse drug reactions. With a safety margin of 2, administering twice the recommended dose would already cause adverse drug reactions. It is good to know that in most developed countries the tolerance of a parasiticidal formulation (i.e. a finished product) must be determined for each target animal species (e.g. cattle, or sheep, or dogs, etc.). Therefore the maximal dose that causes no clinical adverse reactions is theoretically known for each species the product is approved for. But it is certainly not determined for all breeds, nor for all ages, nor for all conditions (e.g. pregnant females, young or old animals, etc.). Therefore there is always a risk that particular animals are less tolerant than expected based on the theoretical safety margin. In any case, the higher the safety margin, the lower the risk of adverse reactions. Unfortunately it happens in numerous less developed countries that tolerance studies for generic formulations are poorly done, if at all. The safety margin of today's veterinary parasiticides range between 3 and >10. Older parasiticides (e.g. organochlorine and organophosphate anthelmintics) now vastly abandoned had safety margins of only 2 and dosing had to be done very carefully. Interestingly, whereas for veterinary anthelmintics (= wormers) the safety margin is often explicitly mentioned in the product label instructions (unfortunately not in all countries), veterinary ectoparasiticides often lack this information. The therapeutic index or therapeutic ratio is another safety parameter. It is the ratio between the single dose that causes the therapeutic effect divided by the LD50, i.e. the dose that causes death of 50% of the animals treated. For veterinary parasiticides the LD50 of the formulation is usually determined only on rodents (rats, mice, etc. ), perhaps on dogs, certainly not on cattle or sheep. Therefore it is mostly impossible to determine the specific therapeutic index, or it is done using the LD50 of the active ingredient on rodents, which can be unreliable. From a purely chemical point of view almost all active ingredients with parasiticidal activity (either ectoparasiticides or endoparasiticides) discovered so far are synthetic organic molecules, i.e. they do not occur in nature but have been synthesized in the laboratory. Very few such active ingredients occur naturally in plants or other organisms. And even fewer are of mineral (i.e. inorganic) origin. Most active ingredients can be grouped into chemical classes or families with similar functional groups, i.e. they share a specific molecular structure. E.g. organophosphates are all derivatives of phosphoric acid. Active ingredients of the same chemical groups have usually the same mechanism of action at the molecular level. What differs considerably for active ingredients on the same chemical class is often the spectrum of activity, the toxicity to both parasites and non-target organisms, their behavior in the environment, etc. Organochlorines (1940): broad-spectrum insecticides and acaricides, nowadays prohibited in most countries. Organophosphates (1950): broad-spectrum insecticides and acaricides. Carbamates (1950): broad-spectrum insecticides and acaricides. Amidines (1960): mainly acaricides and tickicides. Synthetic pyrethroids (1970): broad-spectrum insecticides and acaricides. Benzoylureas (1970): development inhibitors (= growth regulators). Juvenile Hormone Analogues (1970): development inhibitors (= growth regulators). Neonicotinoids (1990): broad-spectrum insecticides and acaricides. Phenylpyrazoles (1990): broad-spectrum insecticides and acaricides. Spinosyns (1990): broad-spectrum insecticides and acaricides, partly systemic. Isoxazolines (2010): broad-spectrum insecticides and tickicides with systemic efficacy. A few active ingredients do not belong to these chemical classes, e.g. cyromazine, dicyclanil. Repellents: do not kill the parasites, but keep them away from the treated animals. Synergist: enhance the parasiticidal activity of certain active ingredients or help to overcome resistance. A few active ingredients do not belong to these chemical classes, e.g. clorsulon, monepantel, nitroxinil.